CAMPAIGNERS against giant wind turbines have issued a rallying cry: ‘We’re not out of danger yet’. The Ill Wind campaign group is delivering around 5,000 leaflets to houses in the South Marston and Stratton area, warning supporters that despite an apparent concession over the number of turbines, “the risk to you is greater than ever before”. The group fears the original plans for three wind turbines at Honda, not two, are still likely, and it is urging no let-up in the fight. Ecotricity, the company behind the plan, says it will settle for two if that is what the council wants. But Des Fitzpatrick, chairman of Ill Wind, casts the campaign as a David- versus-Goliath style battle against corporate spin, and urged residents “not to be fooled”. He said: “Following recent press headlines, radio and TV broadcasts many people in Swindon now believe Honda have reduced their application from three turbines down to two. “This just isn’t the case and we are distributing thousands of leaflets explaining that the application is still for three turbines – and pointing out that, even were Honda to go for two turbines, there would still be thousands of homes within the two kilometre zone that many authorities regard as too close. 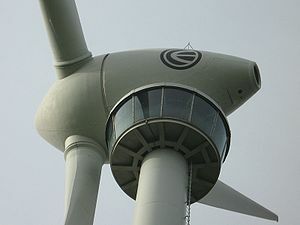 Ecotricity would build and own the 120 metre turbines, and Honda would host them at its South Marston factory. The firms have not withdrawn the original planning application for three turbines, but because of the massive public outcry, they did agree to settle for just two if they have to. This suggestion was tacked on to the existing application, which is due to be voted on by the council’s planning committee later this year. No date is yet set for this meeting, but it is likely to be in mid-October. In a joint statement, Ecotricity and Honda reacted to the Ill Wind campaign. The statement said: “The decision on whether three, two or no turbines are approved sits with Swindon Borough Council, but Honda and Ecotricity have made it clear that if they chose to approve two turbines we would accept this and progress with a development of only two. “If only two turbines were approved, the same planning committee which had refused the third turbine, would have to approve any amendment to build a third, and this would, therefore, be very unlikely. “There is no intent, nor would be any opportunity, to build a third turbine on this site if we received permission for two. “The latest Ill Wind leaflet also repeats a number of falsehoods and inaccuracies about issues including vibrations, sleep and safety that are at risk of confusing or even scaring local people. Having now finally being able to access the planning documents I would simply say to everyone go to http://194.73.99.13:8080/WAM/showCaseFile.do?appType=Planning&appNumber=S/10/1073 and read Correspondence 339104 : It is correct to say that they still view the 3 Turbine option as appropriate but they have gone through the legal process required for the alternative application. It is evident that SBC will not grant the 3.